M.C. Gainey makes a tremendously menacing villain. We saw Mr. Friendly, or “Zeke” as Sawyer calls him, in the season finale “Exodus, Part 2” on the boat abducting Walt, and now the bearded version returned in “The Hunting Party” to put Jack and the group on notice. Jack, Sawyer and John took off in pursuit of Michael, who grabbed some guns and headed off to try and find Walt. This all led to the ultimatum dropped by the Others… do not cross this line. Jack wasn’t about to back down, until Mr. Friendly brought out Kate, who had been captured following the group after Jack specifically told her to stay behind. Kate was not happy when Jack told her to stay behind, despite the fact that he was simply tying to keep her safe and so Kate ignored the order and followed them any way. Playing of that, Jin was going to follow as well, but Sun told him not to, and Jin backed down. Of course, Sun and Jin had a nice talk about it later and they grew closer because of it where as Jack and Kate grew apart more. Back to Mr. Friendly, there is a distinct air of magic surrounding him. 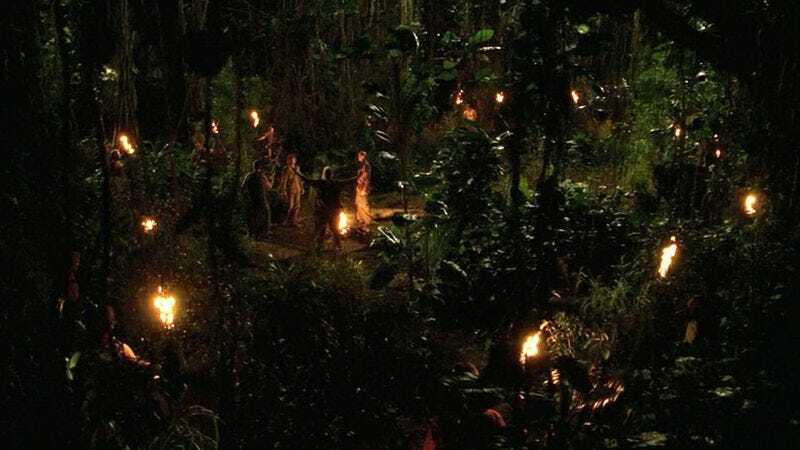 Of course we know now that it is all a trick and that he isn’t at all what he is pretending to be, but when the torches are all lit up, it is a moment of despondency for Jack and his group. The Others were really a great second season villain since we knew so little about them. There are hints dropped throughout the second season that they are more than what they seem, but, in season two, they were mysterious and baffling. There is great dialogue between Jack and Locke and Sawyer in this episode as well. I am continually amazed that anyone would be with Jack against John, since John always appears to be in control and calm whereas Jack is hot headed and yelling. Sure Jack is redirecting his own frustrations and guilt toward other people and he is really angry with himself, but that really does not excuse his behavior. The flashback this episode sees us with Jack and Christian at a hospital telling an old man and his daughter that surgery on his spine to remove a tumor is not going to work for him. The daughter, Gabriella, said that they weren’t here for Christian but for Jack, the man who performed a miracle on Sarah. Jack agrees to try to operate. Jack, in his own fashion, then spends his whole time at the hospital stressing and worrying about the surgery. As I said before, Jack might be an amazing doctor, but if he kept this up, he’d be dead from stress. In the end, Jack is able to get the whole tumor removed, but the old man’s heart gives out on the table and he dies. Gabriella kisses Jack, who backs away because of Sarah. Unfortunately, Sarah reveals to Jack that she is leaving him for another person who she has been seeing. So Jack’s marriage started with a specific surgery and ended because of another surgery. The episode ended with Jack going to talk to Ana Lucia and he asked her how long it would take to train an army. This is an interesting cliffhanger, but it really does not ever go anywhere.